Soumboun’s farm is a family farm where his grandparents used to practice natural farming. A fierce competition amongst farmers in the area pushed the next generation, Soumboun’s parents, to adopt chemicals. 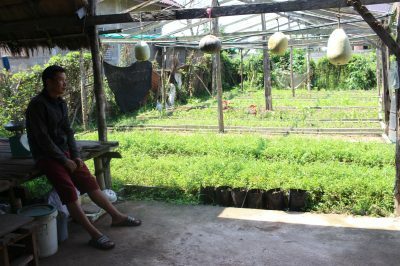 After graduating in agriculture with a major in livestock and working in Panyanivej farm for two years, Soumboun decided to go back to his family farm in 2017. This small-scale integrated organic farm of 3.2 ha is distributed between 3 ha of rice fields, 1 ha of forest where 7 cattle graze all year long and 0.2 ha dedicated to vegetables and fruit trees. Soumboun rears chickens, ducks and frogs in his house backyard, for sale and for household consumption. Soumboun is happy to take care of his family while farming on his land as well as sharing his knowledge with farmers from his community. 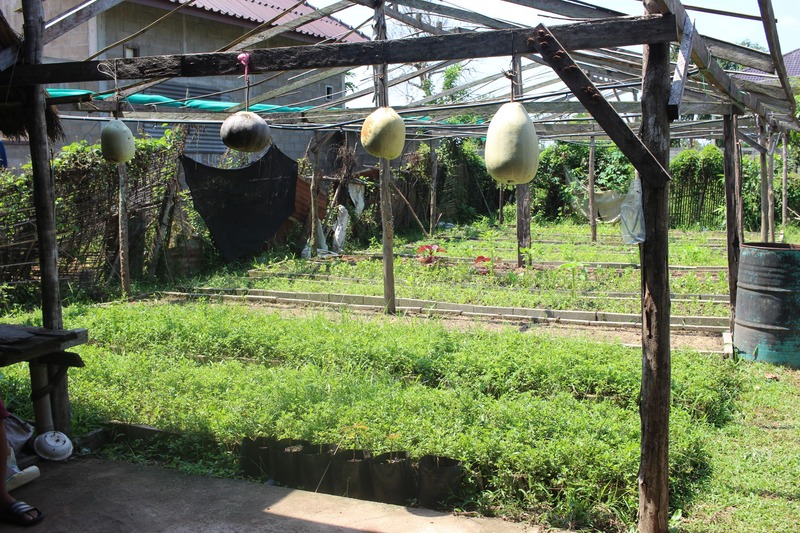 In Soumboun’s farm, a large diversity of vegetables grows next to fruit trees. Depending on the season, mustard, eggplants, chilli peppers, morning glory, beans, salad, celery, spinach and many local herbs can be found. Soumboun is happy to have returned to his family land and reconnected with his grandparent’s traditionnal ways of cultivating. His background, knowledge and experience benefit to the success of his farm and he is proud to preserve biodiversity, maintain soil fertility while providing good and healthy food to his family and his customers. 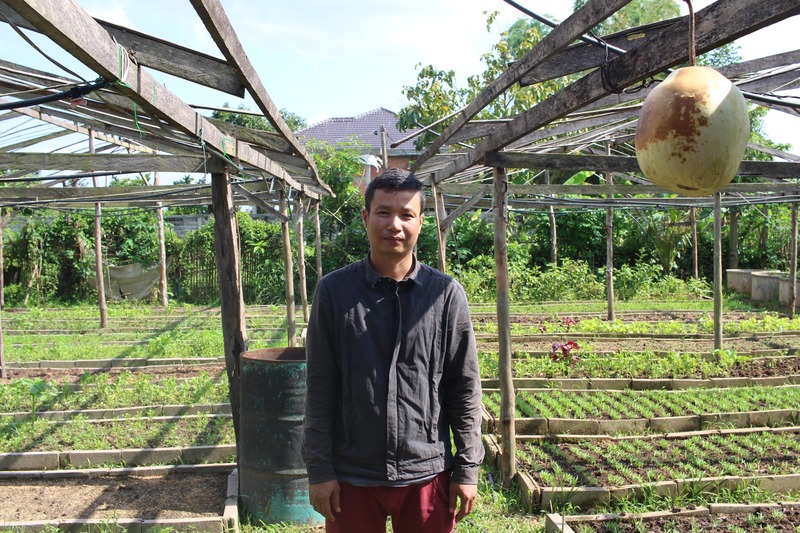 He is keen on expanding his knowledge and had the chance to attend two trainings in 2017, one in Chang Mai, Thailand, organized by Green Community Development Association about organic farming and seed savings and another one on Participatory Guarantee Systems organized by Green Net. Soumboun’s main source of income, estimated at 6 million kips per year, consists of income from livestock, especially chickens and frogs. He can also sell cows if he needs liquidity. 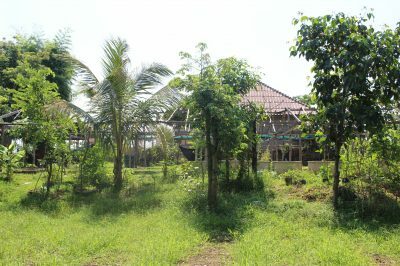 Rice is a good source of income too and accounts for 30%, or 3 million kips, of his income. 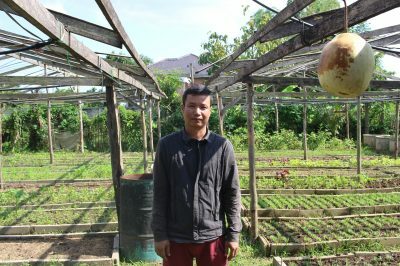 He sells his rice to traders but has made the choice to sell his vegetables, which account for 12% of his income or 1 million kips, directly to his customers who can pick them up at the farm.